A number of trading and analytical platforms allows updating data in Microsoft Excel. RTD.DB has the same formula format. RTD.DB includes ready-to-use formulas for several trading platforms like Thinkorswim and Trader Workstation. You may configure formulas for any RTD or DDE data source yourself. RTD.DB supports multiple database platforms including Microsoft SQL Server, Oracle Database, and MySQL. Creating history tables for stocks, options, futures, and currencies in different time frames. Getting option chains for a wide range of stocks. For example, you may create a history of option data yourself loading data day-by-day. Option data history is the most expensive in the market and does not contain all fields available in trading platforms. For the second case, you may load all options for actively traded stocks. For example, Thinkorswim allows refreshing about 200 tickers at once. RTD.DB cycles tickers and allows loading any number of options. So, RTD.DB is a great tool for traders and investors who need to accumulate real-time data in a database. New application setting <RTD Server>MaxTotalTopics. This option defines the maximum number of topics created for the RTD server. When RTD.DB requires more topics, it restarts the RTD client. This option addresses the bug of Thinkorswim TOS.RTD that allows creating about 200000 topics and then raises the 'pure virtual function call' exception. Set tos.rtdIsDynamicCalls = True if you have no installed Microsoft Excel. NullReference exception in the Configuration Editor. The free RTD.DB edition is no longer available. 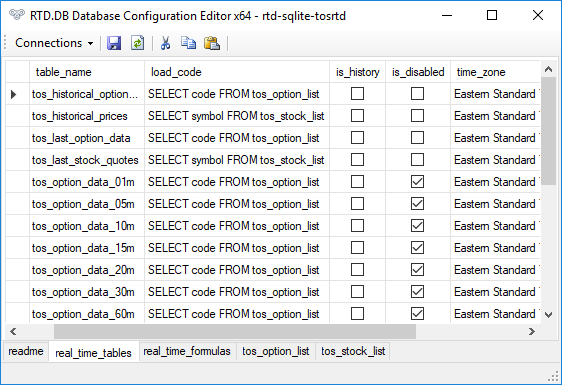 New RTD.DB Database Configuration Editor allows editing database tables. 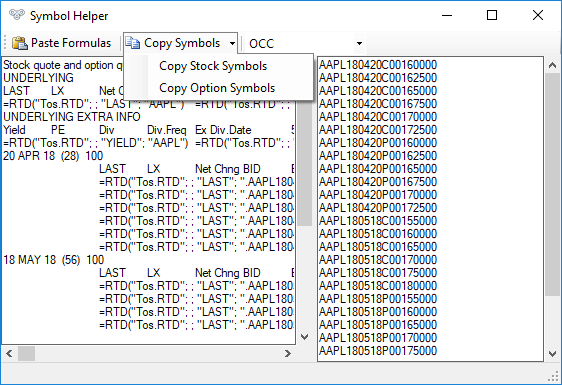 New Symbol Helper allows extracting stock and option symbols from RTD formulas and web pages. For example, you may copy Excel formulas from Thinkorswim and paste it into the application. RTD.DB embeds SQLite and Microsoft SQL Server Compact databases. You may try these databases first and then create the target database in SQL Server, MySQL, or another supported database platform. You may use SQLite ODBC driver to load data from the SQLite database. Also, we recommend using the free Database .NET application to manage databases and select data. You may download the tool at https://fishcodelib.com/Database.htm. New functions to get 30-minute data: DateTime30 and Time30. Databases for Microsoft SQL Server and SQL Server Compact use lowercase names to be completely compatible with MySQL, PostgreSQL, and SQLite. The real_time_tables and RealTimeFormulas tables have new names: real_time_tables and real_time_formulas. Databases include more templates for Thinkorswim data including tables for data updated every second. RTD.DB uses notepad.exe as a default configuration file editor and launches it with administrator privileges if required. You may change the editor using the ConfigurationFileEditor application setting. Improved Thinkorswim default application settings. Improved Thinkorswim default field settings. Fixed empty values of the FrontExpectedMove, BackExpectedMove, and ExpectedMoveDiff fields in Thinkorswim. RTD.DB 5.0 is a major upgrade of RealTimeToDB. The new name reflects the main application role, saving data from RTD and DDE servers to databases. 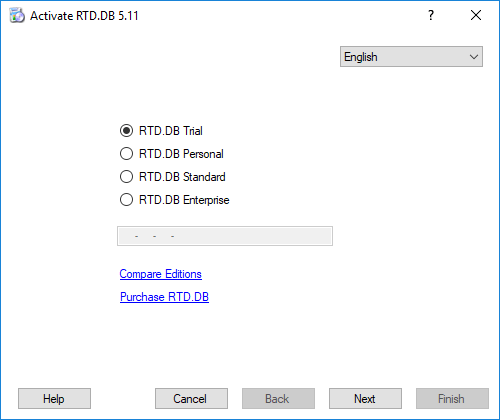 Existing users may install RTD.DB as a new product, test it and purchase the upgrade. See upgrade notes. RTD.DB has a new free edition that allows getting data for 10 tickers. Paid editions have a new simplified model of limits. The Personal and Standard editions have increased limits of updated rows. The trial period is changed from 30 days to 15 days. Registration is required to start a trial. RTD.DB is available as a subscription. Major upgrades become paid. You may purchase Upgrade Warranty with new purchases to get major upgrades for free. Redesigned RTD database. See Database Templates. Rewritten documentation. Please read Concept and Configuring Tables. 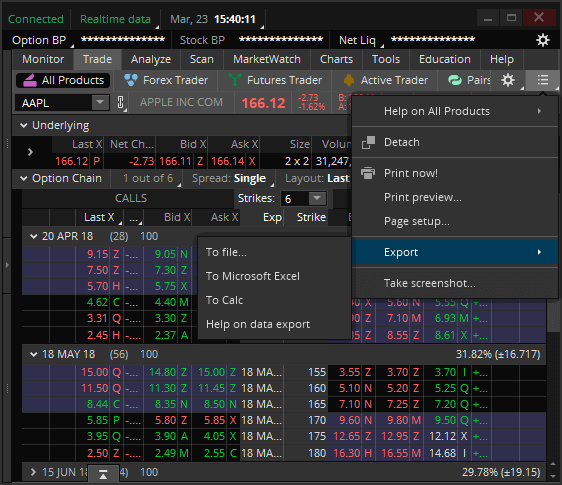 You may use OCC option codes like AAPL180119C0015000 in ticker tables for Thinkorswim Desktop. 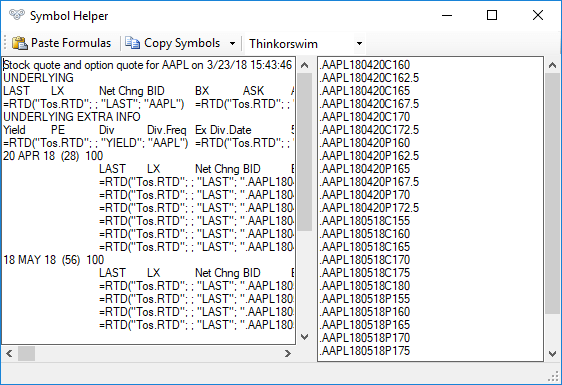 The application converts option codes to the Thinkorswim format like .AAPL180119C150 automatically. Expired option codes loaded from ticker tables are ignored. 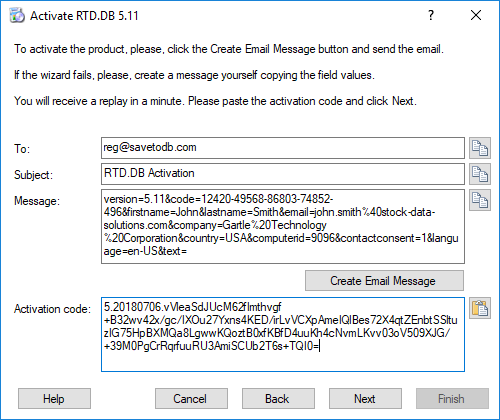 RTD.DB does not include the default SQL Server Compact database with activated RealTimeToExcel. The RTD.DB setup package does not install RealTimeToExcel and related menu topics. We made this change as the most of the product users use SQL Server and MySQL databases, loading data from trading platforms like Thinkorswim or Trader Workstation and paid data sources from vendors like eSignal or Bloomberg. The newest RTD.DB version has a clear database structure and a clear concept to implement such tasks with fewer efforts. You may still use your SQL CE database, or create a new one, and to install RealTimeToExcel separately. RTD.DB allows updating databases with real-time data from trading platforms and paid data sources that support RTD or DDE. * RTD.DB Enterprise supports multiple named instances located in different folders. To install RTD.DB, unzip the downloaded RTD.DB package and run setup.exe. Register the application to start a trial period. Read Concept to learn how to configure your database to get data from trading platforms. To update RTD.DB, unzip the downloaded RTD.DB package and run setup.exe. To uninstall RTD.DB, open Control Panel, Programs and Features, then select RTD.DB and click the Uninstall button. RTD.DB is the next major version of RealTimeToDB. However, RTD.DB is a new product. So, you may have both RealTimeToDB and RTD.DB installed and test the upgrade with minimal service interruption. You may test the upgrade in a trial mode and purchase the upgrade to continue use of RTD.DB. RTD.DB includes the redesigned RTD database. The main install.sql file installs configuration tables only. Other tables are available as Database Templates. You may continue to use your existing databases as is. RTD.DB 5.0 has the same configuration table structures. This End-User License Agreement (EULA) is a legal agreement between you (either an individual or a single entity) and Gartle Technology Corporation for any RTD.DB software, use examples and documentation (Software) that accompany this EULA. or 3) discontinue use of the Software and uninstall the Software. The commercial use of the RTD.DB Personal edition is not permitted. Use of Examples: You may install, access, modify and use Software examples, including Microsoft Excel workbooks, databases, SQL codes, and batch files, for your private or company-internal purposes. INTELLECTUAL PROPERTY RIGHTS AND CONFIDENTIALITY: The Software, including methods, processes and/or techniques utilized therein, is owned by, proprietary to and valuable trade secrets of Gartle Technology Corporation and is protected by Russian Federation copyright law and international treaties. You agree to take no actions that impair or infringe Gartle Technology Corporation&apos;s intellectual property rights in the Software. You agree not to remove, efface or obscure any copyright notices, other proprietary markings or confidentiality legends placed upon or contained within the Software. DISCLAIMER OF WARRANTIES: Gartle Technology Corporation disclaims all warranties concerning the Software and Services (if any), express, implied, or statutory, including without limitation, any warranties, duties or conditions of merchantability or fitness for a particular purpose, warranties of reliability or availability, of accuracy or completeness of responses, of results, of workmanlike effort, of lack of viruses, and of lack of negligence, all with regard to the Software, and the provision of or failure to provide support or other services, information, software, and related content through the Software or otherwise arising out of the use of the Software. Gartle Technology Corporation does not warrant that the Software will operate in combination with other software products selected by you, or that the Software will operate uninterrupted or error-free. Additionally, Gartle Technology Corporation and its suppliers provide the Software and Services AS IS AND WITH ALL FAULTS. THERE IS NO WARRANTY OR CONDITION OF TITLE, QUIET ENJOYMENT, QUIET POSSESSION, CORRESPONDENCE TO DESCRIPTION, OR NONINFRINGEMENT WITH REGARD TO THE SOFTWARE. NO LIABILITY: TO THE MAXIMUM EXTENT PERMITTED BY APPLICABLE LAW, IN NO EVENT SHALL GARTLE TECHNOLOGY CORPORATION OR ITS SUPPLIERS BE LIABLE FOR ANY SPECIAL, INCIDENTAL, PUNITIVE, INDIRECT, OR CONSEQUENTIAL DAMAGES WHATSOEVER (INCLUDING, BUT NOT LIMITED TO, DAMAGES FOR LOSS OF PROFITS OR CONFIDENTIAL OR OTHER INFORMATION, FOR LOSS OF DATA, FOR BUSINESS INTERRUPTION, FOR PERSONAL INJURY, FOR LOSS OF PRIVACY, FOR FAILURE TO MEET ANY DUTY INCLUDING OF GOOD FAITH OR OF REASONABLE CARE, FOR NEGLIGENCE, AND FOR ANY OTHER PECUNIARY OR OTHER LOSS WHATSOEVER) ARISING OUT OF OR IN ANY WAY RELATED TO THE USE OF OR INABILITY TO USE THE SOFTWARE, THE PROVISION OF OR FAILURE TO PROVIDE SUPPORT OR OTHER SERVICES, INFORMATION, SOFTWARE, AND RELATED CONTENT THROUGH THE SOFTWARE OR OTHERWISE ARISING OUT OF THE USE OF THE SOFTWARE, OR OTHERWISE UNDER OR IN CONNECTION WITH ANY PROVISION OF THIS EULA, EVEN IN THE EVENT OF THE FAULT, TORT (INCLUDING NEGLIGENCE), MISREPRESENTATION, STRICT LIABILITY, BREACH OF CONTRACT OF GARTLE TECHNOLOGY CORPORATION OR ANY SUPPLIER, AND EVEN IF GARTLE TECHNOLOGY CORPORATION OR ANY SUPPLIER HAS BEEN ADVISED OF THE POSSIBILITY OF SUCH DAMAGES. LIMITATION ON REMEDIES: Within the first thirty (30) days after your receipt of the Software, should you encounter and report to Gartle Technology Corporation within such time period a reproducible error that causes the Software not to perform in all material respects as set forth in the Software documentation, then Gartle Technology Corporation will, at its sole discretion, either: a) resolve the error or malfunction, and modify or replace the Software (if deemed necessary by Gartle Technology Corporation); or b) allow you to terminate this EULA with respect to the non-conforming Software and, upon your return of the Software to Gartle Technology Corporation, Gartle Technology Corporation shall provide you with the lesser of a) the actual damages incurred by you; or b) the amount you paid for the non-conforming Software. The remedies described in this section shall be your sole and exclusive remedies under this EULA. Reservation of Rights and Ownership: Gartle Technology Corporation reserves all rights not expressly granted to you in this EULA. The Software is licensed, not sold. Consent to Use of Data: You agree that Gartle Technology Corporation and its affiliates may collect and use technical information gathered as part of the Software support services provided to you, if any, related to the Software. Gartle Technology Corporation may use this information solely to improve Gartle Technology Corporation products or to provide customized services or technologies to you and will not disclose this information in a form that personally identifies you. Links to Third Party Sites: We may link to third-party-sites through the use of the Software. The third-party sites are not under the control of Gartle Technology Corporation, and Gartle Technology Corporation is not responsible for the contents of any third-party sites, any links contained in third-party sites, or any changes or updates to third-party sites. Gartle Technology Corporation is not responsible for webcasting or any other form of transmission received from any third-party sites. Gartle Technology Corporation is providing these links to third-party sites to you only as a convenience, and the inclusion of any link does not imply an endorsement by Gartle Technology Corporation of the third-party site. Additional Software/Services: This EULA applies to updates, supplements, add-on components, or Internet-based services components, of the Software that Gartle Technology Corporation may provide to you or make available to you after the date you obtain your initial copy of the Software, unless Gartle Technology Corporation provides other terms along with the update, supplement, add-on component, or Internet-based services component. Gartle Technology Corporation reserves the right to discontinue any Internet-based services provided to you or made available to you through the use of the Software. Upgrades: To use Software identified as an upgrade, you must first be licensed for the software identified by Gartle Technology Corporation as eligible for the upgrade. After upgrading, you may no longer use the software that formed the basis for your upgrade eligibility. Applicable Law: This EULA is governed by the laws of the Russian Federation. Any legal action or proceeding relating to this EULA shall be instituted in a court of arbitration in the Moscow City, Russian Federation. Gartle Technology Corporation and you agree to submit to the jurisdiction of, and agree that venue is proper in, these courts in any such action or proceeding. The prevailing party in any action to enforce this EULA will be entitled to recover its attorney fees and costs in connection with such action. Entire Agreement and Severability: This EULA (including any addendum or amendment to this EULA which is included with the Software) is the entire agreement between you and Gartle Technology Corporation relating to the Software and the support services (if any) and it supersedes all prior or contemporaneous oral or written communications, proposals and representations with respect to the Software or any other subject matter covered by this EULA. To the extent the terms of any Gartle Technology Corporation policies or programs for support services conflict with the terms of this EULA, the terms of this EULA shall control. If any provision of this EULA is held to be void, invalid, unenforceable or illegal, the other provisions shall continue in full force and effect. Termination: Without prejudice to any other rights, Gartle Technology Corporation may terminate this EULA if you fail to comply with the terms and conditions of this EULA. In such event, you must destroy all copies of the Software and all of its component parts and you will not be entitled to any refund of monies. You can use RTD.DB without any limit during a 15-day trial period. You have to activate the trial. To purchase a license and register the RTD.DB Personal, Standard or Enterprise edition. To purchase a subscription and register the RTD.DB Personal, Standard or Enterprise edition. To stop the use and remove RTD.DB from a computer. Before use, please, read the most significant topics: Concept and Configuring Tables. When you understand the concept, take a look at Database Templates. You will find ready-to-use SQL scripts used to create and configure data tables, or, at least, used as templates for your platform. If you use Trader Workstation, please, specify your username in the application settings. Start RTD.DB and specify the actual connection string using the Connection Manager from the File menu. Then click the Start button. In this example, you see that RTD.DB updates four tables with a single data row. 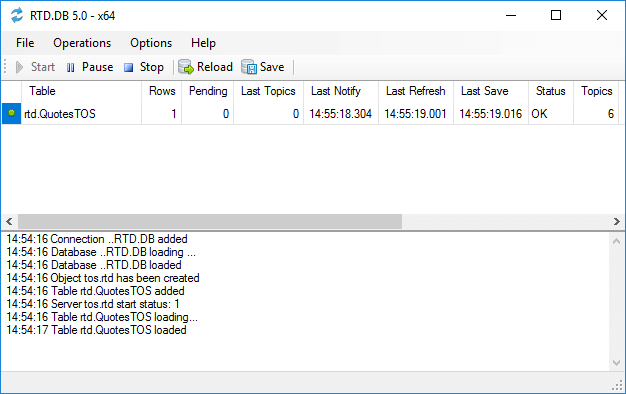 The RTD server notifies and refreshes data, and RTD.DB successfully saves the data to a database. You may learn the meaning of controls and columns in the User Interface topic. Note that the application minimizes to the system tray by default. You may restore the application using the tray icon. Please check the loaded data in data tables. When the application works fine with test data, you may add as many tickers as you need. If you add more the 100 tickers, please read about cycling tickers. You may add new tables for other time frames. Use database templates and learn the built-in functions. Also, you should better understand the configuration tables. If you have issues, please read Troubleshooting. If you cannot find the answer, feel free to contact support. The formulas in other trading platforms are similar. We have to configure this task and then just run a trading platform and RTD.DB to update the data in a database daily. You may create a database on any supported database platform including the most popular free SQL Server Express and MySQL. We recommend naming the database as "RTD" as this name is used by default in the bonus database templates. You have to create database tables to store required data. You may see the QuotesTOS table example above. The downloaded RTD.DB package includes the RTD Databases folder with database templates for all supported database platforms and the tested trading platforms. You may use the templates to create tables in a couple of minutes. Feel free to modify templates to your needs. You have to create a table that contains tickers to refresh. The tables have a simple structure and must contain a column that contains tickers in the trading platform format. To have the common column name for all instruments, let&apos;s use the &apos;Code&apos; column name instead of names like &apos;Symbol&apos; or &apos;OptionCode&apos;. Add first tickers to your table. Later, you may add additional tickers and delete inactive tickers. You may skip creating special ticker tables if you already have a table with tickers in your database. Just modify the ticker table in the configuration described below. Add tickers in your trading platform format. For example, thinkorswim accepts stock tickers like AAPL and option tickers like .AAPL180119C150. RTD.DB must "understand" what tables to update and what formulas to use. You may configure this using two tables, real_time_tables and real_time_formulas, that you have to create once. We fill these tables in the next topics. 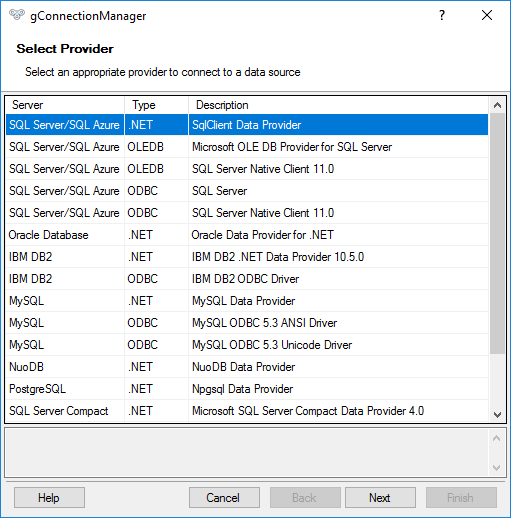 You may find the ready-to-use SQL codes to create configuration tables for all supported database platforms in the install.sql file of the database templates. You may see that all rows configure the rtd.QuotesTOS table. Also, you may see known RTD formulas in the RTD_FORMULA column. However, the ticker position contains the [Symbol] value instead of a ticker like AAPL. This is a trick. RTD.DB substitutes the [Symbol] value with a real ticker. The table contains two rows without RTD formulas, for the Symbol and DateTime columns. The Symbol column gets the value of a real ticker as it has the same name. The DateTime column gets the current date and time value adjusted to the configured time zone. See below. The =DateTime() is an internal RTD.DB function. You may use other functions like =UtcNow(), =DateTime5(), or =Time15(). Note that you may disable updating certain columns setting 1 into the IS_DISABLED column. You may see that we have added the configuration for the rtd.QuotesTOS table and specified two values, LOAD_CODE and TIME_ZONE. The LOAD_CODE field defines an SQL code used to get tickers. In our case, the code selects tickers from the rtd.QuoteListTOS table that we discussed above. Of course, you may use your tables instead. Just modify the SQL code in the LOAD_CODE field. Note an important point. The SQL code must use the AS clause to select the tickers with the column name used in the real_time_formulas table. In our case, the data table and all related formulas use the Symbol name, not the Code name of the rtd.QuoteListTOS table. The second field, TIME_ZONE, defines the time zone used to adjust the current Windows time for functions like =DateTime(). In our case, we use the &apos;Eastern Standard Time&apos; time zone for the US market. If you get data from several world&apos;s markets, you may create different tables and specify different time zones. For example, you may create tables like QuotesTOS_US or QuotesTOS_UK. See available time zones at https://technet.microsoft.com/en-us/library/cc749073(v=ws.10).aspx. The RTD_INSTANCE_NAME field specifies the RTD.DB instance that must update this table. RTD.DB Personal and RTD.DB Standard have two predefined instances: x86 for the 32-bit and x64 for 64-bit RTD.DB executables. You may specify the instance accordingly to the bitness of the trading platform. RTD.DB Enterprise supports user-defined instances configured in the application configuration files. You may use this feature if you load data from several world&apos;s markets and need to turn on and off RTD.DB by a scheduler. You may disable updating certain tables setting 1 into the IS_DISABLED column. We discuss the IS_HISTORY field below. As the final configuration step, we must specify the connection string in the RTD.DB.exe.config and RTD.DB32.exe.config files. RTD.DB connects to the specified databases under the specified credentials. <add name="rtd-mssql" connectionString="Data Source=.\SQLEXPRESS;Initial Catalog=RTD;Password=r#td_2014_abc! ;User ID=rtd"
You may use Connection Manager to configure connection strings in a visual mode. Now, you may start a trading platform and RTD.DB. You may repeat the steps for any trading platform that supports RTD or DDE and any supported database platform. The downloaded RTD.DB package includes the RTD Databases folder that includes database templates for a range of tested trading platforms. You may use these templates to create tables with preconfigured formulas in a couple of minutes. Please read Configuring Tables to learn advanced topics. Such tables get the latest values from trading platforms as the DateTime field is not in the primary key. As discussed in the Concept topic, RTD.DB loads symbols from the ticker tables, uses the current time for internal functions, and gets other values from a trading platform using RTD formulas. We have split the DateTime field to the Date and Time fields, and included the Date field to the primary key. As you see, we have used the =Date() and =Time() formulas for new columns. As you see, the configuration is the same. So, to get end-of-day data in a database, just add the date field to the primary key and specify the =Date() function for the date field. You may find ready-to-use templates in the RTD Databases folder of the downloaded package. We have added the Time field to the primary key. Also, we have added the DateTime field to have an update time. The table contains the well-known formulas except for =Time15(). The =Time15() built-in function rounds the current time to 15 minutes up. As a result, we have 15-minute values in the Time field. RTD.DB updates the record multiple times during 15-minute interval. However, a database contains the 15-minute values only. You may use the built-in functions like =Time1(), =Time5(), =Time10(), =Time15(), =Time20() or =Time60() to get data with the required time interval. You may also save every tick values to a database. RTD.DB executes the INSERT commands only for such tables. The primary key contains the identity column only. The configuration contains an additional row for the ID field with an empty formula. This is important. The configuration differs with the value in the IS_HISTORY field. 1 in this field forces using INSERT commands only. Of course, you may create such tables for stocks, options, and currencies, for any trading platform and supported database platform. The RTD Database folder contains ready-to-use templates for several trading platforms that you may use as is or modify them to your needs. A database must contain two configuration tables used by RTD.DB. The first table configures RTD or DDE formulas. The second table configures updateable tables. 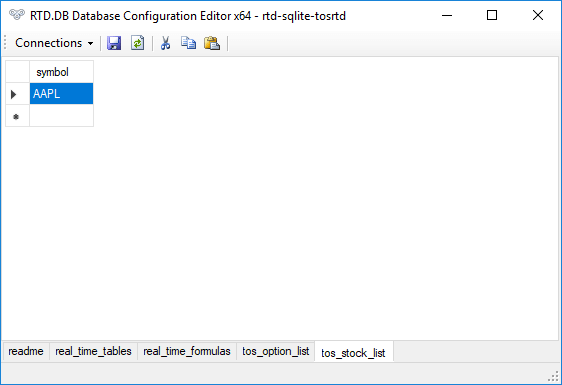 Use the install.sql file in the RTD Databases folder of the downloaded package to create tables in any supported database platform. Read the Concept topic to have basic knowledge about configuring tables. The table can contain an additional primary key first column. The TABLE_SCHEMA and TABLE_NAME fields specify a database table. The COLUMN_NAME field specifies a column of database tables. The RTD_FORMULA column specifies an RTD or DDE formula used to get real-time data. The IS_DISABLED field allows disabling field updating. Use this if you do not want to delete the row. Formula format is very similar to Microsoft Excel. However, the formulas must contain a parameter in square brackets instead of real tickers. The columns of the rtd.QuotesES table are updated from the eSignal FutureSource real-time RTD server ("esrtd"). The columns of the rtd.QuotesTOS table are updated from the Thinkorswim thinkDesktop real-time DDE server ("TOS"). rtd.QuotesES contains the Code column that is used as a parameter. The Code column belongs to a task table (see below) and does not exist in rtd.QuotesES. However, such parameter fields must be specified in the field configuration table to load parameter columns into the table column set. rtd.QuotesTOS contains the Symbol column that is used as a parameter. rtd.QuotesTOS contains the Time column calculated by RTD.DB as TOS have no time fields. See the complete list of built-in functions. The IS_HISTORY field allows switching on the history mode. In this mode, RTD.DB uses insert commands to update data first, and then uses the update command if the inserting has failed. The IS_DISABLED field allows turning off the table update. The TIME_ZONE field defines the time zone of the table. This time zone is used to adjust the current PC time in built-in functions like =Time(). Specify &apos;Eastern Standard Time&apos; for US exchanges. The RTD_INSTANCE_NAME field specifies an RTD.DB instance that updates the table. Other instances ignore the table. RTD.DB Personal and RTD.DB Standard have two instances: x86 for the 32-bit and x64 for 64-bit RTD.DB executables. RTD.DB Enterprise supports user-defined names configured in the application configuration file. The second row selects codes &apos;AS Symbol&apos;. This trick required to select tickers with the column name specified in the formula configuration table. 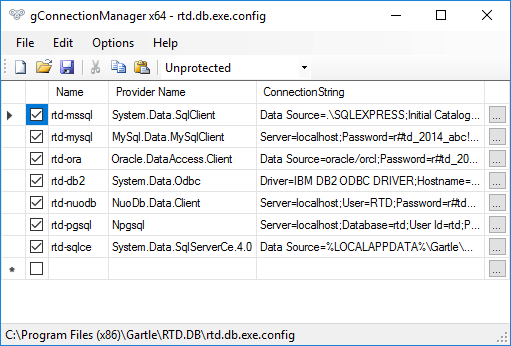 As mentioned above, use the install.sql file in the RTD Databases folder of the downloaded package to create tables in any supported database platform. The RTD Databases folder also contains ready-to-use templates to create data tables including required configuration formulas. You may change the application settings in the RTD.DB.exe.config and RTD.DB32.exe.config files. RTD.DB loads application settings at the application start. So, you have to restart the application to reload settings. Use the File, Open Configuration File menu item to open the file. You may edit the file using notepad.exe or another tool. Use the File, Open Connection Manager menu item if you need to edit the connection strings only. The configuration file can contain the appSettings and connectionStrings sections. This string value defines the application culture used for user interface translation. This boolean value defines the immediate start of data updating after the program start. Start the application with administrator privileges for updating data from DDE servers that require such privileges (TOS, VFX). This string value defines the application used to edit the RTD.DB application configuration file. The default value is notepad.exe. This integer value defines the server connection timeout in seconds. This integer value defines the timeout of command execution in seconds. This string value defines the instance name used to select table configurations using the RTD_INSTANCE_NAME field. This boolean value allows minimizing the application window in the system tray. This integer value defines the interval of data refreshing in milliseconds. This integer value defines the interval of checking changes in task tables specified in the LOAD_CODE field of the real_time_tables table. This string value defines RTD and DDE servers that require administrator privileges. RTD.DB requests elevating for these servers. This string value defines a username for InteractiveBrokers Trader Workstation (TWS). This name is used in real-time formulas like =S<TwsUserName> by default if the =S server is specified only. This integer value defines the maximum number of topics created for the RTD server. This integer value defines a maximum number of active tickers connected to the server. This option prevents server overhead. RTD.DB changes the tickers cyclically. This integer value defines a minimum number of milliseconds that a ticker must be connected to the server before it is replaced with a new one when the total number of tickers is more than MaxUpdateRows. This integer value defines a maximum number of milliseconds that a ticker can be connected to the server before it is replaced with a new one when the total number of tickers is more than MaxUpdateRows. This boolean value defines a calling model for the RTD server: IRtdServer typed calls or dynamic calls. thinkorswim thinkDesktop requires the dynamic model if Microsoft Excel is not installed. This integer value defines the maximum number of refresh cycles without data refresh that starts reconnecting to a server. Use this option if the server must return real-time data every time but may have issues. This string value defines an RTD.DB add-in used to preprocess data. Usually, trading platforms have limitations for a number of refreshed tickers. To update large numbers of tickers, RTD.DB cycles them. You may specify the number of tickers in a group and required time to update a group (in milliseconds) in the application settings for every RTD or DDE server. There are no "right" settings. You may experiment with them. Pay attention to the platform stability, a number of pending rows, and database data quality. The settings above are quite good for thinkorswim. You may suggest the time required to update the required number of tickers. For example, you plan to update 10,000 tickers (stock tickers or option codes). RTD.DB updates 100 tickers every 20 seconds. I.e. 300 tickers per minute. 10,000 tickers / 300 tickers per minute = 33 minutes. If you have a fast computer, disk, and a network, you may try to increase the number of tickers to 200 and decrease the update time to 10 seconds. In this case, you decrease the total time to 33 / 2 / 2 ~ 8 minutes. In any case, you have to understand that a lot of tickers requires a time to update. And these data are not real-time. You may separate your ticker tables to have real-time data for smaller numbers of active tickers and end-of-day data for others. You may find the application icon in the system tray also. Opens the RTD.DB.exe.config file. You may check or edit application settings. Opens Connection Manager to edit connection strings in a visual mode. 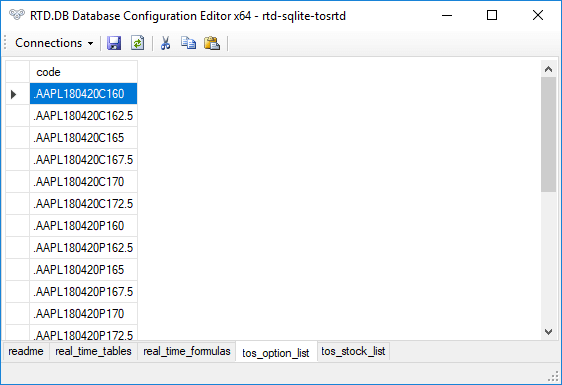 Opens RTD.DB Database Configuration Editor to edit database configuration tables and symbols in a visual mode. Opens Symbol Helper to extract stock and option symbols from RTD formulas or web pages and paste symbols into database tables. Stops all the running services and closes the application. Starts updating databases with real-time data. Stops the timer that starts updating databases. Use this button to stop updating temporarily. To start updating, click the Start button. Stops all the running services. Saves current data to databases and reloads data from databases. Use this button to reload data when you add new tickers to database tables. Saves current data to databases immediately. Use this button, if the services have been paused, or you need to update the data before the next timer event. Opens the online help web page. Opens the support web page. Opens the product web page at the official website. Displays the Register Product wizard. Opens the web page to start purchasing. Opens the web page to download updates. 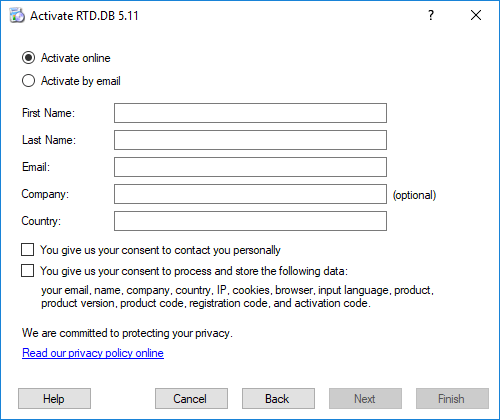 Displays the About RTD.DB dialog box. The image indicates table status: green or red. The column displays database table name. The column displays loaded row count. The column displays a number of pending rows. The column displays a number of topics that the real-time server returns on the last data refresh. The column displays the time of the first data change notification from the real-time server after the last data refresh. The column displays the start time of the getting changed data from the real-time server. The period between the notification and getting the changed data depends on the RefreshTimerInterval value. The column displays the time when the last data have been saved to a database. The period between the notification and this time shows the maximum delay for real-time data in a database. The column displays the status of real-time server and database operations. The column displays a number of topics connected to the real-time server. Usually, this is the row count multiplied by real-time column count. The column displays average speed of saving data to a database in milliseconds per row (MSPR). 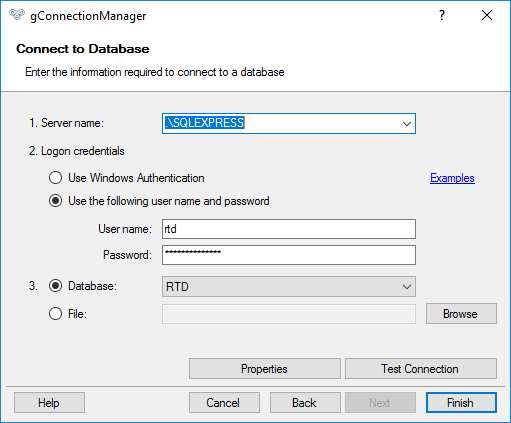 The column displays RTD server ProgIDs or DDE service names. The column displays database servers. The column displays database names. You may also enable or disable the existing connection strings. Click the "..." button to edit the connection string. The different database servers have specific features. Click the Help button or the Examples link to get the context help during the connecting. The wizard tests the connection in the background and activates the Finish button if the connection succeeds. If the Finish button is disabled, click the Test Connection button to test the connection. 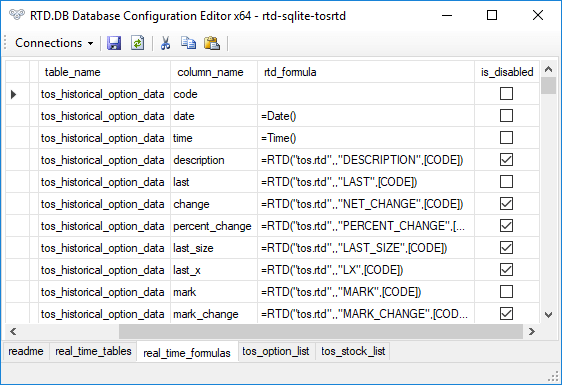 The Configuration Editor allows editing RTD.DB configuration tables in a visual mode. Also, the editor allows editing tables used as a symbol source. The editor detects such tables using the LOAD_CODE field. The editor shows active RTD.DB connections configured with the Connection Manager. You may add or modify any field. Then click the Save button to save the changes. Check the is_disabled field to stop loading data into a table and uncheck to activate. Check the is_disabled field to stop loading data of the field and uncheck to activate. We recommend loading only necessary data to avoid wasting trading platform resources. Below are examples of the tables used as a symbol source configured in the LOAD_CODE field. You may paste symbols as is. The configuration editor pastes new unique symbols only. You may use Symbol Helper to extract stock and option symbols from RTD formulas or web pages. 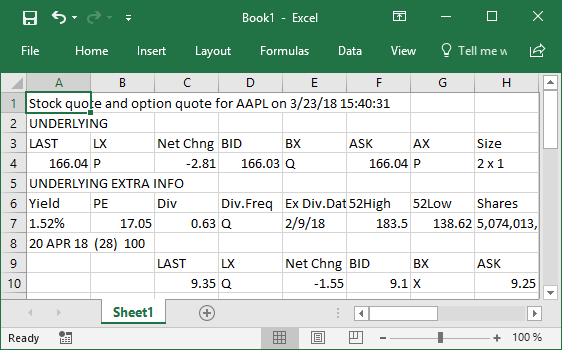 Symbol Helper allows extracting stock and option symbols from RTD formulas and web pages. You may paste symbols into symbol tables using the RTD.DB Database Configuration Editor. The editor pastes unique symbols only. You may paste option symbols from websites like Yahoo Finance or MSN Money. Just select and copy the page content and paste it into the Symbol Helper. Also, you may copy and paste formulas from Microsoft Excel. Click Formulas, Show Formulas before copying. Otherwise, you will copy values but not formulas. The formula configuration table contains Excel-like formulas for getting data from RTD and DDE servers. You may use built-in functions to update date and time fields if a server has no such fields. Note that the current time is adjusted to the table time zone specified in the table configuration. The second application of built-in formulas is getting aggregated time intervals like 15 minutes. Just use the formulas like =DateTime15() or =Time15() to round up the current time. =TimeStamp() Returns the current UTC datetime. =UtcNow() Returns the current UTC datetime. =Now() Returns the current datetime. =TableNow() Returns the current datetime adjusted to the table time zone. =DateTime() Returns the last data update datetime. =DateTime0() Returns the last data update datetime rounded to 1 second up. =DateTime1() Returns the last data update datetime rounded to 1 minute up. =DateTime5() Returns the last data update datetime rounded to 5 minutes up. =DateTime10() Returns the last data update datetime rounded to 10 minutes up. =DateTime15() Returns the last data update datetime rounded to 15 minutes up. =DateTime20() Returns the last data update datetime rounded to 20 minutes up. =DateTime30() Returns the last data update datetime rounded to 30 minutes up. =DateTime60() Returns the last data update datetime rounded to 60 minutes up. =Date() Returns the last data update date. =Time() Returns the last data update time. =Time0() Returns the last data update time rounded to 1 second up. =Time1() Returns the last data update time rounded to 1 minute up. =Time5() Returns the last data update time rounded to 5 minutes up. =Time10() Returns the last data update time rounded to 10 minutes up. =Time15() Returns the last data update time rounded to 15 minutes up. =Time20() Returns the last data update time rounded to 20 minutes up. =Time30() Returns the last data update time rounded to 30 minutes up. =Time60() Returns the last data update time rounded to 60 minutes up. You may preprocess data before sending to a database using add-ins implemented with C++, C#, VB.NET or other languages. This feature can be used for broadcasting data, for example. The ProcessRow method is called before saving data to a database. The add-in can read the column data of the current row and change it using the Item property. The data processor add-in must be attached in the configuration file. You may find add-in examples implemented with C# and VB in the DataProcessor.zip file in the downloaded package. You may find ready-to-use templates for several trading and database platform in the Database Templates folder of the download package. Create a database on your target server if necessary. Select a folder of the target database platform like Microsoft SQL Server. Open, check, and execute the install.sql file to create configuration tables. Select a folder of the target trading platform like tos.rtd. Open, check, and execute files like QuoteListTOS.sql and OptionListTOS.sql to create ticker tables. Add tickers to the newly created tables like QuoteListTOS and OptionListTOS. Open, check, and execute files like QuoteDayHistoryTOS.sql or Option15MinuteHistoryTOS.sql to create data tables and configure formulas. Configure the connection string using Connection Manager or the application settings directly. You may add other tables (step 8) later. You may use such files as templates for other tables. 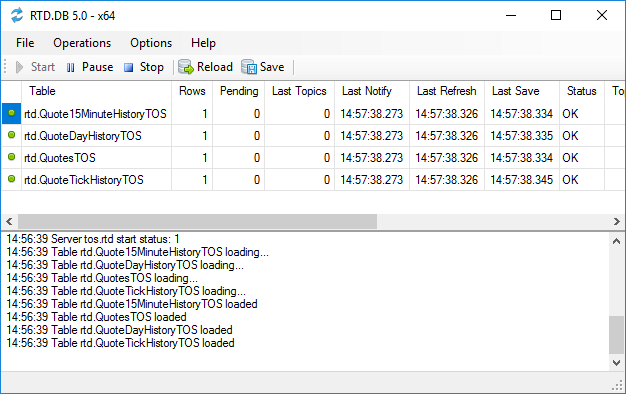 For example, you may use the Option15MinuteHistoryTOS.sql file to create the Option10MinuteHistoryTOS table. Just copy the file and use Search and Replace to change the table name. The RTD.DB window has two main parts: a table monitor and a log text box. The table monitor shows actual status for each updated table. See column meanings in the User Interface topic. The log shows diagnostic and error messages. Click File, Open Connection Manager and test your connections. Check that your database has two required configuration tables. Check your formulas in the RealTimeFomulas table. The formulas must use the same RTD or DDE server name as in regular Microsoft Excel formulas. For example, tos.rtd or esrtd. If you work with Trader Workstation, specify TwsUserName in the application settings. Also, try to run the instance with another bitness. For example, RTD.DB32.exe if you started RTD.DB.exe before. If you have no Microsoft Excel installed, try to change the IsDynamicCalls setting in the application settings. Check that you have started the trading platform. It is required. If this is not a case, try to run the instance with another bitness. For example, RTD.DB32.exe if you started RTD.DB.exe before. Check the configuration in the real_time_tables. It must contain the valid schema, name, and load code. Check the LOAD_CODE value in the real_time_tables table. Check that your ticker table contains tickers. Check the formulas in the real_time_formulas table. For example, you may have the difference in a table schema or name. Also, specified RTD or DDE formulas may be invalid. This happens when the RTD or DDE server does not respond. Check that the server is alive. Check that the real_time_formulas table contains primary key fields. Read the message. It should explain the reason. This is correct if you do not specify a column formula in the real_time_formulas table or disable the column update. If the formulas are okay, try to set the English (United States) regional settings in the Windows Control Panel. If this helps, please contact us to fix detecting settings. RTD.DB requires registration to start a trial and to use it after the trial period. To register, open Help, Register Product. Also, you may open Start Menu, All Programs, RTD.DB, Register Product. You may register the trial version with the built-in product code. 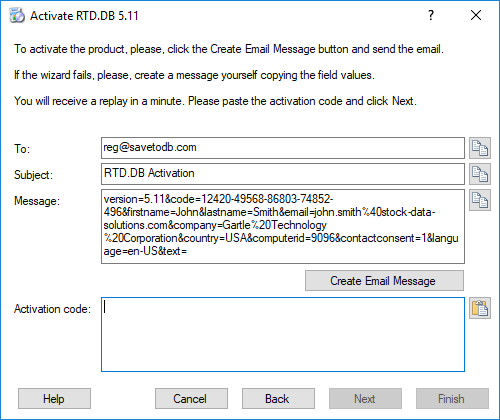 To register the RTD.DB Personal, Standard, or Enterprise edition, fill-in the product code received after purchasing. The Next button is enabled when you check the required field about the personal data use. 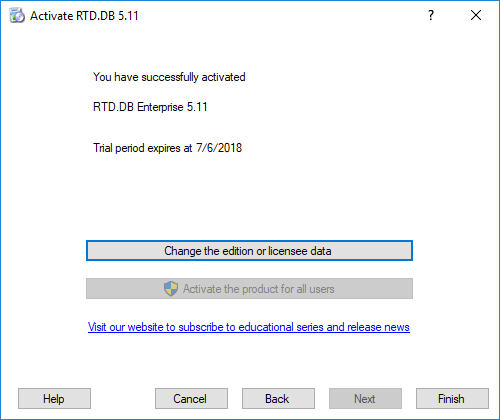 After clicking the Next button, the RTD.DB connects to the registration server. Click the Create Email Message button to create an email. If starting the email program has failed, please create the registration email manually using the shown registration data. Just copy and paste the To, Subject, and the Message fields. The registration server sends the reply in a couple of seconds. The Next button is enabled when the activation code is valid. Click Next to finish the activation.